Fast assisted opening action-just flick the stud on the back spine of knife for instant blade deployment! This Platinum Collection Gent's folder is just like our larger version of the same knife, but these are a little smaller, measuring 3 3/4" closed. 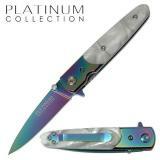 3" Ti-treated rainbow spectrum high carbon blade. 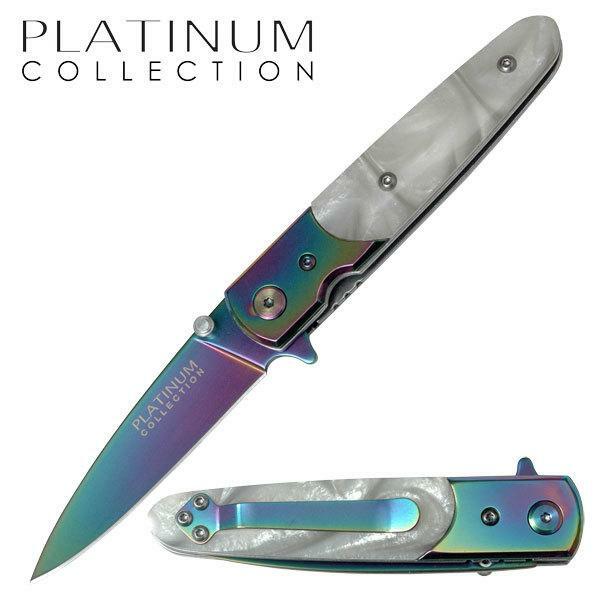 Aluminum handle frame with Ti-treated spectrum rainbow stainless bolster overlay and faux white pearl colored inlay. Metal pocket clip.